Tea, that very English infusion, originally came from China. Fast wooden sailing ships would compete to bring the precious cargo back. 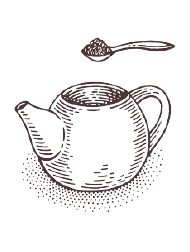 China, especially bone china, was specially made for the enjoyment of tea. Before the advent of modern transport, tea was very expensive. Making it was a ritual, and after use the leaves were mixed with lavender petals and swept over drawing room floors to gather up the dust.